Includes 3 hours video lessons (mp4 files) and one 80-page manual (pdf file). It is suitable for intermediate players and above. I started watching the first video this morning and it is exactly what I am looking for. I have been searching for ages for instruction that starts with the basics, provides different options for one song and explains things clearly and slowly. From what I have seen so far your course does just that. I am really looking forward to spending time practicing the different songs and trying out your techniques on other favourites. This course already has started opening doors for me. 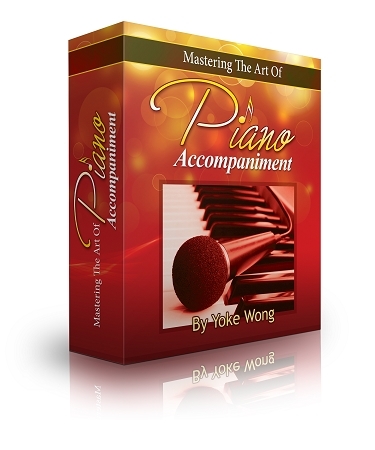 I ordered Mastering the Art of Piano Accompaniment last month. I am very satisfied with the quality of the video course. In the video, Mrs Yoke Wong explained thoroughly every step of what she was playing , sometimes using slow motion. The course cover many styles that can be applied to music of different tempo( eg: 3/4, 4/4....) . The course helped improving my piano playing and made me feel confident knowing that I learned the right technique. Overall, I am very happy with my purchase. Fantastic Course. I love you. I'm only on first two videos and its amazing! and you are so generous to let us pay in 3 installments. God Bless you Yoke!! Dear Yoke, This course is just what I needed to spice up my left hand. It's important for me to understand why and how things work and this course does just that! Purchasing this course will not be a waste. Thank you! I wish you were in Texas!